St. Vincent de Paul Village is a world-renown comprehensive continuum of services to the homeless community of San Diego. Founded by the Catholic Diocese of San Diego, it is now a non-denominational, federally recognized non-profit corporation. St. Vincent de Paul Village truly is a "village" in which individuals and families may live for up to two years, and the team of physicians in the UCSD Combined Family Medicine & Psychiatry Residency Program are the "family doctors" and psychiatrists for the Village. Many residency programs have contributed valuable service to homeless medical clinics in the past, but this program's collaboration with St. Vincent de Paul Village is believed to be the first time that a residency program has established its full "out-patient home base" for continuity of care in such a "Village Medical Clinic" in service to the homeless community. St. Vincent de Paul Village's web site can be found at www.fatherjoesvillages.org. Watch a short video about St. Vincent de Paul Village here. Located at the UCSD Medical Center Campus and providing over 30,000 patient visits per year, the "OPS Clinic" is UCSD's major site for teaching ambulatory psychiatry. Part of the clinic serves as an outpatient "private practice" model for both the combined and traditional training programs. The clinic also provides services for county-funded patients. Multi-disciplinary teams consist of attending physicians, psychiatry residents, medical students, social workers, psychologists, MFT interns, and psychology trainees. The UC San Diego Health System serves as the county hospital for the San Diego metropolitan area. It provides the backdrop for much of our clinical work. From family medicine wards to geropsychiatry to outpatient orthopedics, our residents gain valuable knowledge and experience at our core hospital. Learn more about UCSD Health Care and the UCSD School of Medicine. Of the 25 million veterans currently alive, nearly three of every four served during a war or an official period of hostility. About a quarter of the nation's population -- approximately 70 million people -- are potentially eligible for benefits and services because they are veterans, family members or survivors of veterans. The goal of the San Diego VA Medical Center is to provide excellence in patient care, veterans' benefits and customer satisfaction. Combined residents help with this important mission by rotating through several departments and providing an integrated medical skill set while rotating through various medical and psychiatric services. Learn more about the San Diego VA Medical Center. Rady Children’s Hospital is the San Diego region’s only designated pediatric trauma center and the only area hospital dedicated solely to pediatric care. Designed specifically to help kids get and stay healthy, Rady Children's promotes healing and reduces anxiety through a unique combination of design, light, color and art. Within this environment of caring, children and their families become part of the healing process. Combined residents rotate on the inpatient service and in the emergency department, where they gain valuable experience in pediatric medicine. Located adjacent to beautiful Balboa Park, Naval Medical Center San Diego (NMCSD) is the most technologically advanced Navy medical treatment facility. 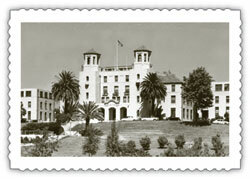 Nicknamed "Balboa, the Pride of Navy Medicine," the hospital has played a vital role in the history of San Diego for more than 80 years. From the original tent dispensary established in 1917, to the high-tech, ultra modern facility of the 1990s, the mission has remained constant to provide the finest medical care in a family-centered care environment to the operational forces, their families, and to those who served their country in the past. Combined residents deliver babies, see newborns, and manage patients in the neonatal ICU at "Navy Balboa" hospital. Residents also see outpatients in surgical subspecialty clinics such as ophthalmology and ENT. The Kaiser managed care system also provides an important training opportunity for the Combined Program. Residents rotate through outpatient pediatrics and a number of surgical sub-specialties through the Kaiser system. The experience not only provides important clinical training, but also a different system of practice management. The Jacobs Medical Center at UC San Diego Health is a 245-bed advanced medical center. The 10-story, 509,500-square-foot facility opened on Nov. 20, 2016. Its medical services include advanced surgery, cancer care, clinical trials, birthing options and more. UCSD Family Medicine, and the Combined Program in particular, enjoy a close relationship with our neighboring family medicine training program at Scripps Chula Vista, just a few miles to the south. Combined residents rotate with the Scripps Chula Vista residents during the PGY-2 year to get additional experience with inpatient medicine and obstetrics in a community hospital setting. The UCSD and Scripps Family Medicine residents and faculty also come together several times per year for special didactic programs, such as half-day symposia on sports medicine, maternity care, geriatrics, and adolescent medicine.